The Heath Quartet performs a free, hour-long concert at the David Rubenstein Atrium as part of Lincoln Center’s new “Complimentary Classical” series. 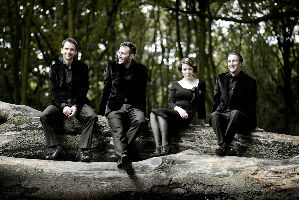 Formed in 2002 by four string players at the Royal Northern College of Music in Manchester, England, the award-winning Quartet has collaborated with such world-class artists as tenor Ian Bostridge and composer Sofia Gubaidulina, and regularly performs at London’s Wigmore Hall. Audience members can purchase drinks and refreshments from the ’wichcraft cafe onsite.